Oh dear Lord, I'm rarely lifted out of my body into the ether of such heavenly sartorial splendor. I almost needed to be sedated whilst viewing this collection by Alberta Ferretti. Since I started paying attention to all things runway several months ago, I was pleasantly surprised to find so many new fashion loves, to go with the expected, Chanel, Dior, Dolce & Gabbana, Louis Vuitton, and Valentino. Trite choices to be sure, but completely warranted, all with storied histories and obvious bona fides with respect to fashion expression, construction, artistry of ensembles, etc. 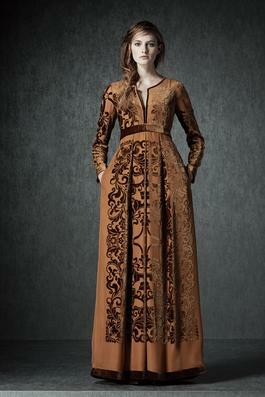 Now I must include Alberta Ferretti in this pantheon of creative wizards. Hers is an interesting take on pre-fall which tends towards eclecticism, with a casual bent and the obligatory gowns and such towards the end of the show as a brief denouement. As a contrast to the usual, this collection is composed of striking pieces, in typical silhouettes, that are for evening goings on and other elegant affairs. An homage to past eras, visions of Camelot and ancient Greece are conjured. The evening gowns are fitting for a wide spectrum of fashionistas, the chic 20 year old uptown girl, the usual suspects at the gala affairs and random openings, and the lover of wondrous spectacular beauty, in form and fabrication. Jacquard, cloque, silks and my personal favorite, V E L V E T appear in abundance. And elevating the collection is a series of coats to top off the frocks. The evening jacket in quilted embroidered velvet (drool) or metallic jacquard is actually a pragmatic choice when pondering what to wear to an event requiring shaved legs and dry underarms. As a working stiff who must occasionally scurry quickly directly after work to a fleeting supper before a Gala opening, the thought of slithering into a full length gown while simultaneously negotiating the requisite stilettos and contemplating how much face paint to apply, after working for 9 hours, makes me want to reach for a strychnine cocktail. Yeah, um, no thanks. And this is where the extravagant jacket comes in to play. A timeless (yeah, I know, sometimes "banal") silhouette allows all versions and degrees of embellishment, festooning, etc, without seeming overwrought. In essence, you have form and function. A wacky silhouette might impress on first glance, but might become tiresome down the road. And that's fine with shekels to burn, but these days, financial prudence has taken on paramount importance. Your mortgage broker won't be impressed with your zest for jacquard and love of Lesage if you've foresaken FICO for fashion. The knock out jacket can be thrown over a dress, skirt, or ball gown as needed, and then over more casual fare when tooling around town. There are several entries in this beauteous display that fit that bill. If you plan to raid your piggy bank or mattress, make sure the piece is impeccably crafted, COMFORTABLE, and something you'll wear today and 20 years from now. After some low level agonizing about what I'm wearing to the Ballet opening tomorrow, I've opted for a Chanel jacket that has made several appearances outside my closet. I'm throwing it over a T shirt and Louis Vuitton skirt. And of course, black Manolo's. No fuss, no muss. Remember, the gorgeous wearable jacket is your best friend! And you will find some eye-poppers in this inspired collection. Perfect understated glamour. 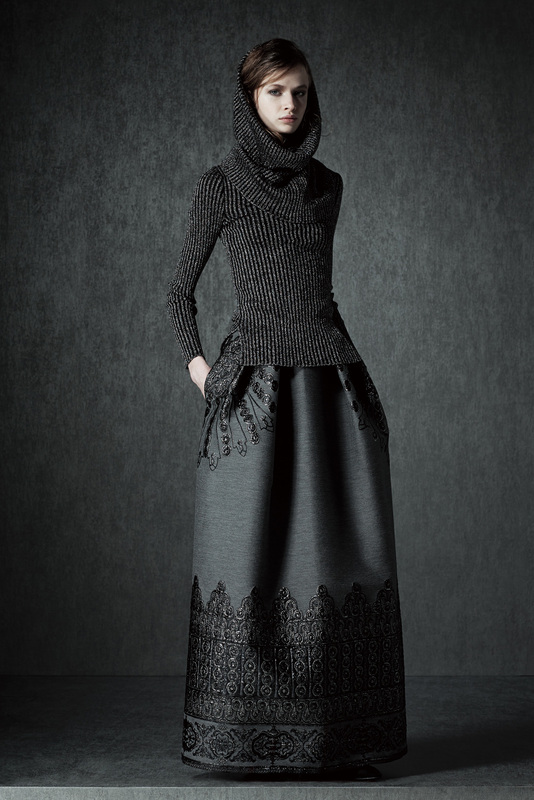 The metallic hooded sweater is an unusual compliment to this stately skirt. And if a schwitz should manifest, pull down the hood. For a theatrical element, throw on reams of pearls. Those boots are pretty damn hot, will spice up any outfit, including the diaphanous dress above, a mini or cocktail frock, or even culots. 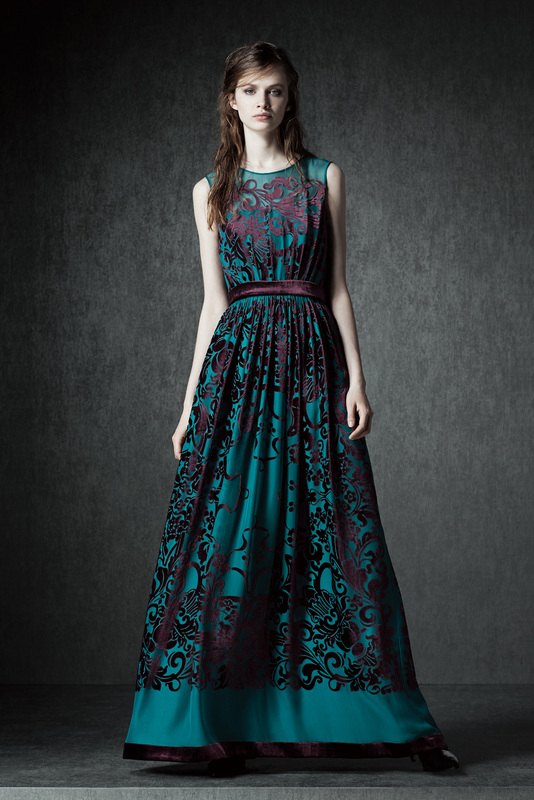 Beautiful, with the laser cut velvet in regal teal and purple. Wear with velvet flats. One of the best looking coats from pre-fall, no doubt. The outfit in toto is a dynamic duo fit for any hoity toity to do, however both pieces are stunning in their own right, more precious due to their wearability. No body part is getting constricted, only gussied up. And I'm guessing the coat might be reversible. S W O O N…. She does even Boho proud. Ok, I've died and gone to heaven, this is THE perfect outfit. Each and every piece, including the shoe booties are divine. This jacket will go anywhere forever. And, will cover a host of real or perceived sins. Should one indulge beyond the limits of decorum in typical holiday culinary fare, no need for spinning or any other such insufferable activity. Instead, just throw this bit of perfection on and go for a brisk walk! Yeah, I'd wear this to an opening. (Well, if I was 5' 10"). You gotta love that jacquard cummerbund fanny pack. Genius. Excellent encapsulation of GRECIAN GODDESS. 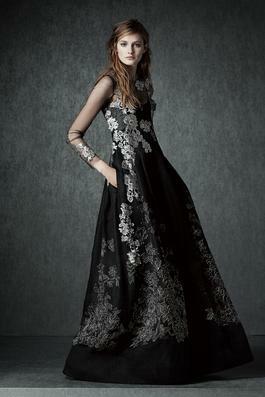 My favorite gown from pre-fall. Even the Tuxedo makes an appearance. Jacquard suit with just a hint of fur, capes, full length gowns any of which I'd be proud to wear…….sigh, the perfect evening collection. This is a more conservative entry to be sure, but stunning nonetheless with the engaging aubergine color and just a bit of bling. Velvet, more velvet, admixed with appliquéd chiffon, in a deep plum. Yummy x 100.
Who doesn't want to be swathed in quilted velvet in a pleasing neutral color? Charmeuse silk mini slip dress with floral appliqué and contrasting bodice armor, more welcomed irony. Satin cloque in a steely purple, another favorite. Even the shoe booties in this collection are eye catching and appropriate, to be worn long after the gown gets stashed in the closet…….drool. Another BRAVURA performance by Alberta Ferretti.